Libraries have been working hard to provide the best services to young children and families. We offer amazing early literacy based storytimes and programming. We have fantastic board and picture book collections. Maybe we offer play spaces or even circulate toys. Some of us are providing special programming for caregivers and training for early childhood providers. We’re getting out and partnering with schools and organizations. Now, how do we let our communities know about all of these amazing services? One excellent opportunity is the community resource fair. 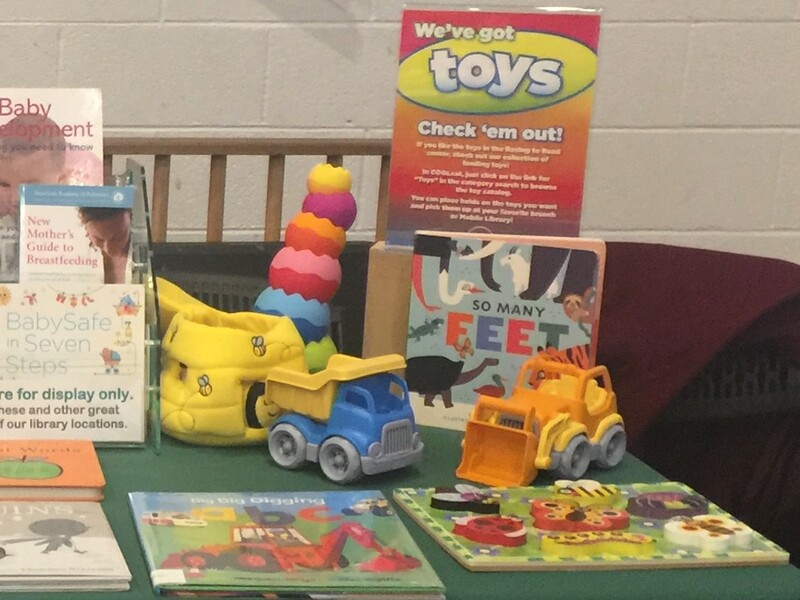 Display at the 2017 Baby Affair, a resource fair for expecting families. Resource fairs can take many forms. They may be for families or educators, might be all non-profits or include vendors from businesses, they may focus on specific age groups, they can be information based or as part of a larger recreational program. Whatever the format, a resource fair is an opportunity to showcase the services your library offers families. If you are new to resource fairs or want to up your game, here are some tips that may help you. 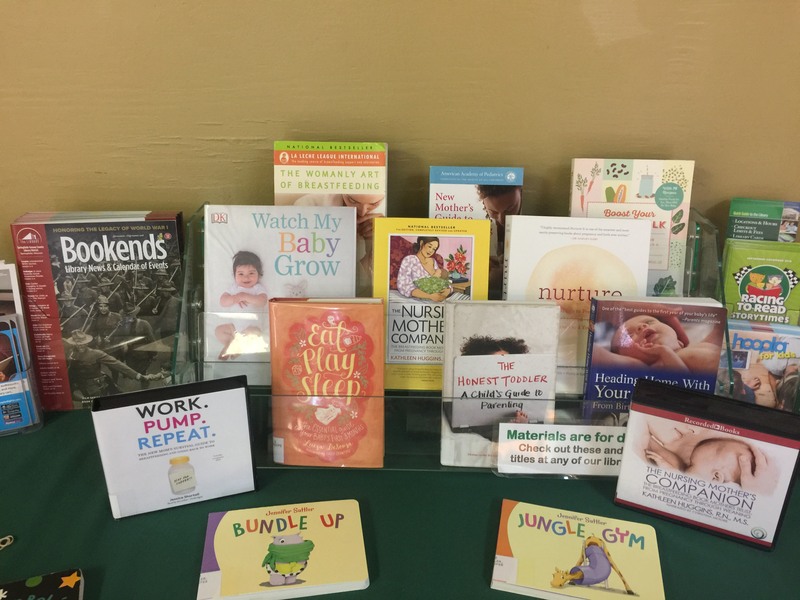 Parenting book display at La Leche League’s annual resource fair. I almost always have a book display regardless of the audience. In our community, our library is well-known and used which is fantastic, but it also means that at resource fairs many people wave and say, “we love the library, we know what you do!” and keep right on going. Of course, they probably don’t know everything we offer and would love to be one of the first to hear about the new program coming up at their branch so I need to convince them to stop. A great picture or board book display almost always makes people slow down to look. After showing them the book I have a chance to say, “did you know…” and our conversation can move from there. Educators absolutely love to see new books and don’t always get to see them right away so a book display will definitely encourage them to stop. I often display parenting books, cookbooks and health books too. I don’t check out books remotely but many people do place a hold using their phone or take a picture to remind them later. This is a great lead-in to how to get a library card for patrons who don’t have one. Toy display at a neighborhood resource fair. If you have play spaces in your libraries or a circulating toy collection, consider displaying a couple of toys. Choose toys that look nice and are the right age group for your event. Be ready to explain to families any guidelines for playing in a play space or how to access the toys in your catalog if they circulate. Our circulating toy collection is one of the things families seem to not know about so I like to show it off when I can. And just like with books, fun toys encourage people to stop and talk. Of course, resource fairs are designed to allow you to share any promotional materials you may have. No need to try to get everyone to take everything, instead focus on handing out the most beneficial item for the person you are talking to and then let them take anything else they find useful. This is also a great place for any early literacy materials you might have. 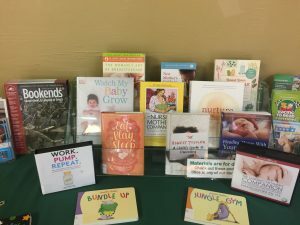 Flyers and bookmarks that encourage families to play and read together are often just a popular as the materials showcasing programming and basic services. Swag – the pencils, stickers, cups, etc. that have an organization’s logo – are often a big part of resource fairs. Brooke Sheets actually wrote about this on the blog last summer so check out her tips: Swag for Kids. 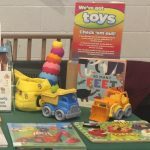 Some resource fairs may require you to have an activity for kids and even if they don’t, a great idea for an activity families can make themselves is a nice addition to a display table. Discovery bottles are great for all ages and families are often looking for new ideas to play with the alphabet. Our community does an annual event called Community Wide Play Day at a local park and we often have bins of sand with letters from alphabet puzzles hidden in them. A big hit for kids and caregivers like to see the idea in action. Consider writing up instructions for making your activities and have them available for families to pick up. Lay out your table in a useful way so traffic can move easily. Consider how much space you have. There is a big difference between a six foot table and a four foot table so plan accordingly. Less is more, too much stuff is overwhelming. You also may want to bring some wooden boxes to add height to some signs (this can give you more room). Acrylic sign holders and display stands are nice but if not available in your system think about cheaper baskets until you can budget for some. A tablecloth with your library’s logo also looks polished, but again, a simple cheaper tablecloth in your library’s colors with a printed sign with your logo displayed can work too. You may want to consider having a tablet to show off your library’s website or online resources, but check and make sure you have internet access. One last thing, don’t forget the other exhibitors. Exhibitors often walk around and check out other booths so be ready to share information that they may like to share with their clients. Community organizations will often ask me if they can have a few leftover brochures after the event to give to their families to encourage them to go to storytime. In turn, learn about their services so you can point patrons who can benefit in their direction. Partnerships can be perfect promotional opportunities! 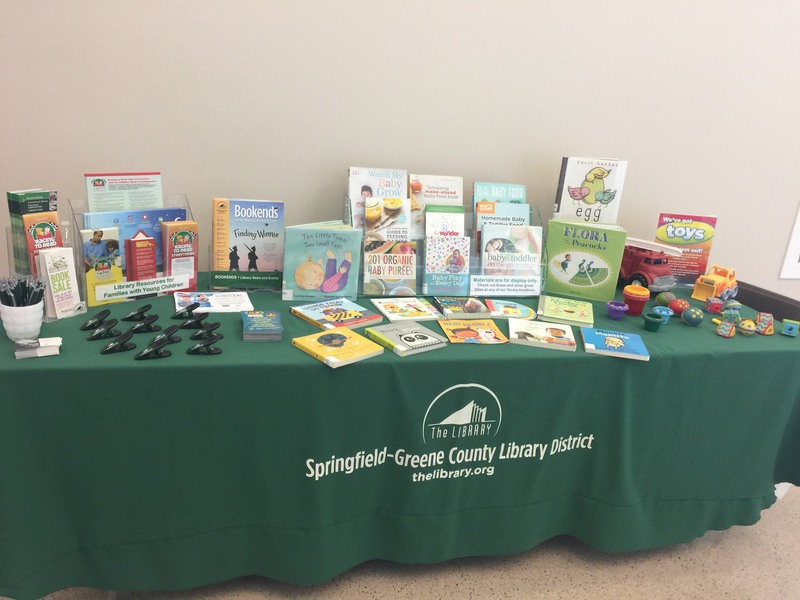 Community resource fairs can give you the chance to showcase your library’s programs and services to a large portion of people in a short period of time. By thinking critically about your audience and creating a display that supports their needs, you can reach even more families. Please share any additional tips in the comments! Stephanie Smallwood is the early literacy specialist at the Springfield-Greene County Library District in Springfield, Missouri. Smallwood wrote this piece as a member of the ALSC Early Childhood Programs and Services committee.